Sometimes it seems like between Halloween and Christmas, Thanksgiving kind of gets forgotten about. 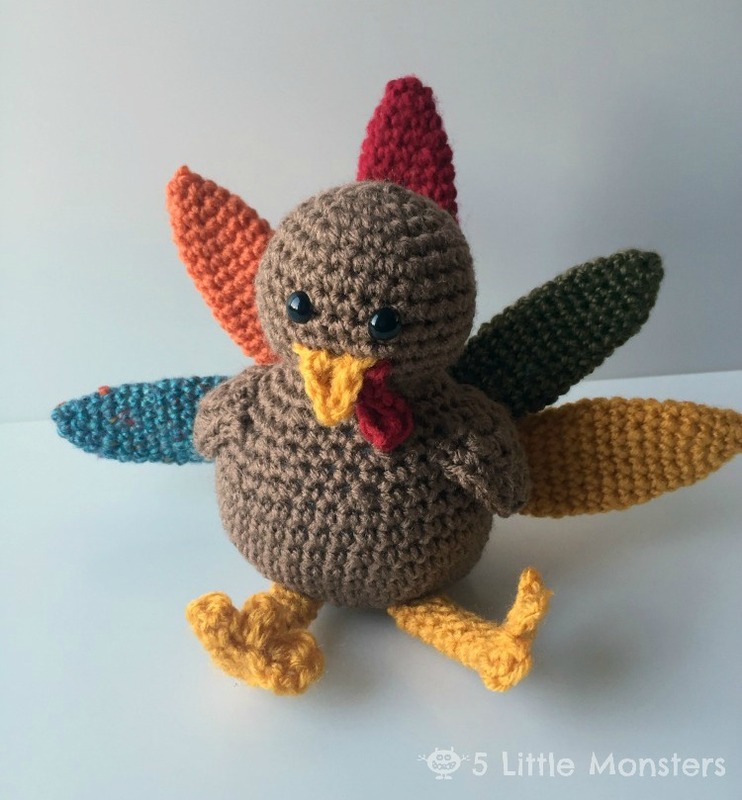 I thought it would be fun to make a little crochet project for Thanksgiving and a turkey seemed like the perfect thing to make since a turkey is one of the first things I think of when think of Thanksgiving symbols. This little turkey is made in several pieces that are then sewn together. I put a little pouch of weighted stuffing beads in the base to help it sit up. I made colorful tail feathers and sewed them fanned out on the back of the turkey. I made the pattern for Fairfield World and you can find it HERE. That is the coolest turkey ever. I love this little guy but I'm confused on the wings. At the end of each row there are a bunch of stitches in parenthesis. What are these for? Where are they worked? Thanks. I always put the total number of stitches at the end of the row. They are not stitches to work again but should match up with the number of stitches you worked in that row or round. I'm loving this pattern! And your other works. But I'm having trouble with the turkey's legs. I get the "toes" but from there I can't seem to get it. Any help would be great! !